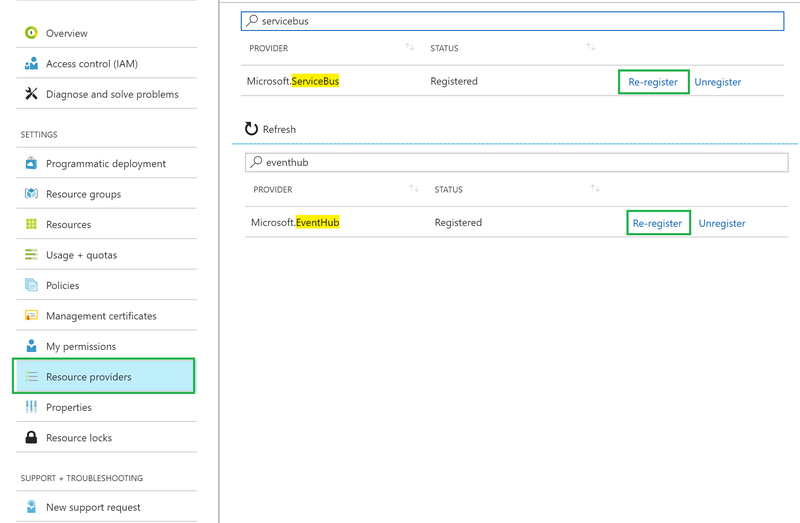 How to Re-Register ServiceBus and EventHub Resource Manager Providers? Sometimes, some Azure Services require changes in theitr resource providers. When that happen, new resource providers are deployed inside of Azure Platform. Usually, you do not have to take care about this, because it ia a PaaS service. However, you might already have applications in production, which have dependency to that service. Depending on change in the resource provider, this also does not have to be neccesairly your problem. But sometimes changes might be relevant to your existing applicaiton. For example, Microsoft has released new fetaures in ServiceBus and EventHub. To be able to use new features in existing service you might have to re-register resource type provider. To do this, goto your subscription, select "Resource providers" blade and search for wanted provider. In my case these were ServiceBus and EventHub providers. As you see on picture below, they are enable for re-registration.